Happy Friday! Lately I have been really obsessed with different jewelry pieces and layering, especially personalized pieces. Many pieces of the jewelry I wear has a “B” or a “J” on it for my name or Jadyn’s. From a larger statement necklace to a tiny pinky ring, I’ve been accessorizing with these for awhile now. Personalized jewelry is the perfect gift to give someone else as not only is it simply adorable, but it offers a more sentimental and personal touch than just a regular piece of jewelry. Regardless of if you wear it forever or not, personalized jewelry is something you will always keep and maybe even pass down to loved ones, which is why I usually spend a little bit more money on my pieces. There are a few brands that are my absolute go to’s when it comes to personalized pieces and I wanted to share them with you guys. Below I have linked some of my favorite personalized jewelry pieces so you guys can add them into your looks too! 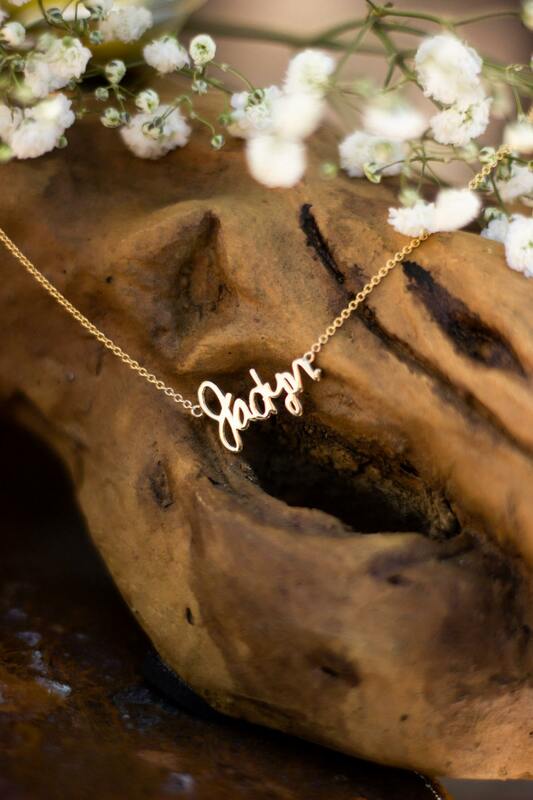 Sincerely Jewelry specializes in personalized signature necklaces, so you can hold your loved one’s signature wherever you go. They are able to craft any signature into a beautiful necklace! Their necklaces can be created in 14k gold (yellow, rose or white) or combined with diamonds. The necklace I’m wearing above that says “Jadyn” is actually Jadyn’s own signature which is so sentimental to me. It’s the perfect piece to layer with other necklaces or even to wear on its own as a beautiful statement piece. Not to mention, it makes the perfect gift! Zoe Chicco jewelry is one of my favorites for gifts because the pieces are so incredibly fun and unique. The brand is known for their personalized 14k necklaces that includes a set of initials or name and adorable charms/pendants you can add to the necklace. Their charm builder allows you so much freedom to custom build your own necklace from the chain style to the font. 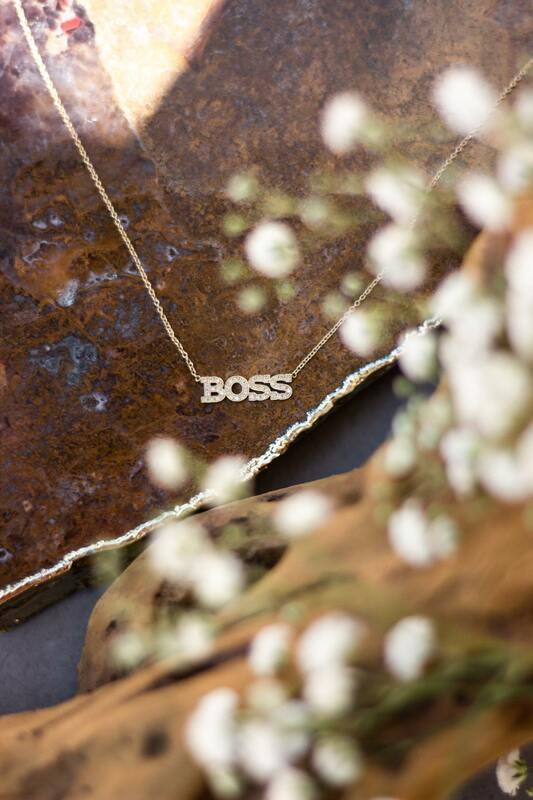 If you aren’t into the charm builder, they offer other personalized pieces, like this 4 letter necklace I have with the words BOSS. I’m absolutely obsessed with this diamond letter necklace, it lays elegantly across my neckline and is the perfect combination of statement and tasteful. Sarah Chloe is another one of my go-to brands for personalized jewelry due to their more traditional pieces. They have a great necklace selection and customizability with personalization. I personally love their initial rings! This signet ring is the ultimate addition to my jewelry collection and I am in love with it. The signet style pinky ring feels traditional and almost vintage but still remains being incredibly modern and chic on the finger. I seriously wear it all the time, it’s the one featured in most of my Instagram photos. Another brand that creates yet again stunning and sentimental pieces is Zoe Lev. I like how their personalized pieces are more dainty and delicate. This brand has created one of my all time favorite pieces of personalized jewelry with their beautiful diamond asymmetrical initial necklace. It’s a very dainty necklace and lays effortlessly against my neckline, I love it. Some of my friends have multiple versions of these necklaces with initials of many of their loved ones. Even getting your first and last initial looks so chic, I may just have to get another one. The M Jewelers took Instagram by storm and rightly so because their pieces are so cool and also affordable! Whether you pick the trendy gothic style personalized choker necklace or the crazy and cool name frame ring you luckily do not have to break the bank. The brand offers pieces from vermeil to 14k gold so there is something for everyone shopping no matter your price point. The brand is also always having insane sales and offers!